the aspect of errant food i enjoy the most is the fact that it almost never resembles the original recipe upon which it is based. tex-mex and traditional latin american cuisine have some crossover, but they also have some massively dissimilar areas (e.g. flour tortillas). american chinese takeout and traditional cantonese cuisine are loosely associated at best. curry, which is consumed all over central, southeast, and southern asia, is one of the most illustrious errant foods. if you have ever had japanese curry, you may have wondered why its flavor, color, and texture are closer to beef stew than indian or thai curry. the reason is simple: japanese curry isn’t based on indian curry. it is based on british curry. the british were the first to introduce curry to japan. as curry made its way from india to britain, the recipe changed to incorporate more readily available ingredients, such as beef. by the time this british version of curry was filtered through the japanese culinary lens, the result was far from what any indian person would consider reminsicent of curry at all. it isn’t just curry, though. japan is rife with errant foods, and while they do not always resemble the foods upon which they are based, they are absolutely delicious. doria (a gratin-esque dish which uses rice instead of potatoes), tempura (lightly battered and fried veggies or seafood), and ramen (noodles served with a variety of different broths and toppings) are among japan’s most adored errant foods. my favorite, however, is what the japanese call nikujaga 肉じゃが. 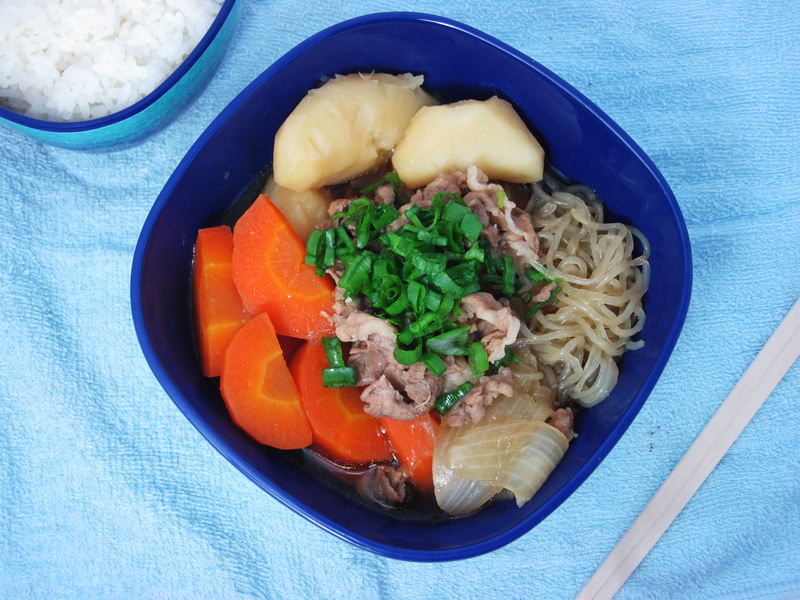 although the word nikujaga means “meat and potatoes,” it can contain thinly sliced beef or pork, carrots, konnyaku noodles, green onions, snow pea shoots, onions, and even bamboo shoots. the ingredients are simmered in a sweet soy broth under a flat wooden lid known as an otoshibuta. 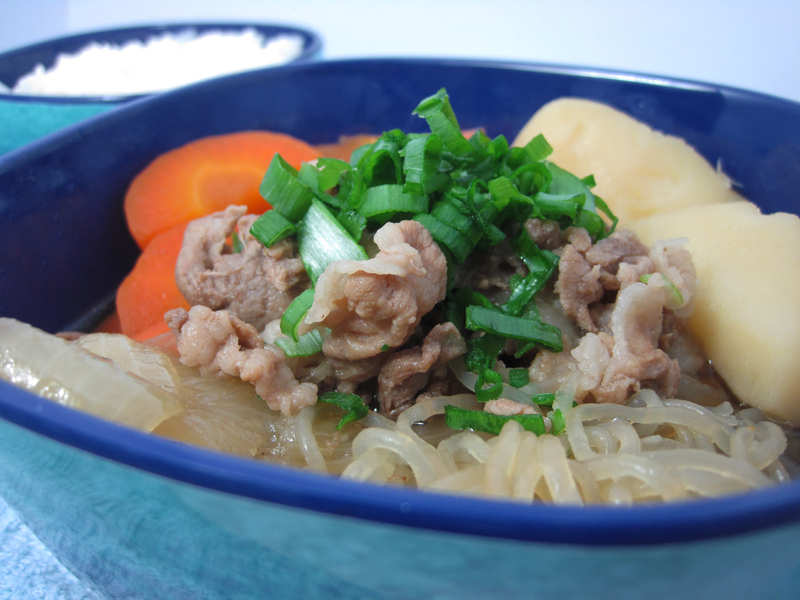 while it is a stew, nikujaga doesn’t require hours upon hours of cooking. most versions require only thirty minutes from start to finish. starting to understand why i like it so much? but i don’t just enjoy nikujaga because it is delicious. i like it because, like most errant foods, it has an awesome history. most historians agree that the origin of nikujaga can be traced back to a single person: tōgō heihachiro, admiral of the japanese imperial navy. he was in kagoshima when the british bombarded the city during the anglo-satsuma war. a year later, in the boshin war, he fought the against the tokugawa bakufu in the first modern naval battle in japanese history at the age of 20. he supported japanese troops in the first sino-japanese war. in 1905, he even destroyed the russian baltic fleet at the battle of tsushima during the russo-japanese war, proving to the world once and for all that japan was a force to be reckoned with. he wrote once in his personal journals that he was convinced he was the reincarnation of admiral horatio nelson. yes, he was that good. when his 50-year military career had run its course, he was put in charge of the personal education of the future emperor of japan, crown prince hirohito. tōgō’s mastery of the english language and cunning interpretations of international maritime engagement rules command respect even today. not to mention his incredibly dapper mustache-beard combo. while he was living, he was bestowed a list of accolades so long it would double the length of this post (which is already far, far too long). the accolades bestowed upon him postumously is even longer. when he died, the navies of great britain, the netherlands, france, china, and the united states all sent ships to the naval parade thrown in his honor. he is, in short, one of japan’s most decorated and impressive heroes. however, unbeknownst to most japanese people, he was what the japanese refer to as a kuishimbo (someone who loves to eat). he had a particular love of foreign food. and that is where this story finally comes together. supposedly, during the formative years of the japanese imperial navy, tōgō did his best to recall every bit of information about the seven years he spent training in naval academies in britain. because britain had one of the most famous and powerful navies in the history of the world at the time, he took it upon himself to make the new imperial navy in the image of british imperial glory. learning to mimic the ships, training, education, battle tactics, ammunition, equipment, and military procedure of the british navy was a given. but admiral tōgō apparently wanted to take things a step further. he decided that because british sailors ate a lot of beef stew, it was mandatory that japanese sailors eat beef stew as well. so he described the dish to the cooks of kure, a port in hiroshima, and they did their best using the ingredients that were made available to them. the cooks, never having eaten or even heard of beef stew, had no choice but to produce an errant food. you guessed it. the result was nikujaga. and it has been a japanese favorite ever since. drain the package of shirataki. they are going to smell a little funky, so prepare yourself. once all the water is drained, boil the noodles in plain old water for only a minute or two. run them under some cold water, strain, and set them aside. put a little bit of oil into a large frying pan or deep pot, then add a little bit of oil. once the pan has reached medium heat, add the onion. once it starts to soften a little, add the pork and cook it until it is no longer pink. add the dashi, soy sauce, mirin, and sugar. do not stir. trust me. once the broth is assembled, place the potatoes, carrots, and shirataki into the pan separate from one another. the broth should just barely cover everything in the pan. bring the contents of the pot to a boil. skim the pork gunk off the top of the broth as best you can. you don’t need to get it all, it is mostly just for appearances. bring the heat down to medium-low and place the otoshibuta on top. if you don’t have an otoshibuta, you can use a piece of tin foil with the edges bunched so as to fit inside your pot and rest on top of the vegetables. punch three or four holes in the middle of the foil to allow for steam to escape. set a timer for 15 minutes, then go do something else. seriously. don’t stir it, don’t mess with it, don’t even look at it. it’ll be fine. cut the base off your green onions and chop them finely. set them aside to be used as garnish. after your time is up, remove the lid and kill the heat. you can sample a potato or carrot if you are worried about them not being cooked enough. here is the tough part. leave. go do something else and forget you ever cooked nikujaga. just leave the pan right there. you can cover it if you want, but you don’t have to. after an hour or so, come on back, turn the heat on once more, and bring the contents of the pan to a simmer. kill the heat and get ready to eat. put a little bit of shirataki and a few pieces of carrot, potato, and pork into a deep bowl. ladle some of that sweet soy broth over the top, then garnish with a little bit of green onion. once your bowl of rice is ready, feast like you’ve never feasted before. This entry was posted in culinary history, culture, dinner, japanese food and tagged Easy, History, Japanese Food, Man Food, Meat, Nikujaga, Soup, Washoku. Bookmark the permalink. ← sesame-covered tebasaki: just winging it. This is an excellent post Misha. Long, yes, but I do think I’ve learned quite a lot from reading it! I’d vote for ‘errant foods’ to be an official term… it has quite a ring to it. I might just adopt it here in Australia and see how far it spreads! As for this dish: I’ve never heard of it and as a British ex-pat I am quite intrigued to know that it was created as a replica of beef stew. Awesome. It looks rather delicious! I love reading about the origins of different foods (like Cornish pasties being created so that housewives could throw meat and potatoes down to their husbands in the mines). Your explanation of Japanese curry explains a lot. By the way, have you ever tried Japanese cheesecake? It’s… interesting. I’d love to know the origins of that one. i didn’t know that about cornish pasties. that is pretty darn cool. i’ll look into japanese cheesecake. i’m sure it has some sort of cool errant food history. if i end up stumbling upon anything juicy, i’ll let you know. Has anyone ever told you that you are an excellent storyteller? I love that about food, how it tells us the stories of ourselves. Spices are one of my rather large obsessions. The history of spice, its conquest, capture, capitulation to consumerist powers…(ohmylord alliteration alley). I am also endlessly fascinated by the very social nature of food. So much of what and how we eat has to do with how others will percieve us more than what food is actually for – our nourishment. Yet, the social nature of food itself nurtures a very visceral need, a soul hunger… and I am going to choose to shut up now. But really. I love your stories. thanks, i do my best to spin a good yarn whenever i can. oh man, don’t get me started on spices. i could write a 50 page dissertation of salt alone. one of my favorites is saffron. saffron used to be cultivated in philadelphia in the 1730s, and it was so popular in the caribbean that, for a time, it sold for the same price as pure gold. also, i do my best to get back in touch with that “nourishment” side of food. that is why i cook hearty and cook often. i do my best to steer clear of things like molecular gastronomy. stuff like that has become a hallmark of the excess present in a lot of first-world cultures. balsamic spheres are nice, but totally unnecessary. when there are people in the world who don’t know how to feed themselves anything but frozen dinners, such a use of resources is a little bit irresponsible. when we can all feed ourselves in a healthy, responsible, sustainable way, then (and only then) should we be making balsamic spheres. Intelligent and good in the kitchen. No wonder you teach children. You’re superman or something. My favourite has to be cinnamon. I’m a sucker for any biblically referenced spice really. I just love the idea of a spice made by scraping the bark off of a tree. Not to mention it was a gift fit for monarchs, or gods. I may be a really super brilliant english major by day, but by night I’m so with you. I feel like a hippie most of the time because I believe food should be simple, healing and nourishing. Oh yeah, I believe you can heal your body with food. I have. I know, obviously I spend every night dancing beneath the moon giving blood offerings to trees. Since I actually think that what I put in my body as fuel affects how my body runs. Sustainability is so integral not only to the continuation of the human race, but really to our mental well being as well. When you live in a society of food excess you forget how to really cherish what you put in your mouth, and then you forget to cherish your body.. and then the world and everyone else in it. I love, love, love nikujaga. Everything about it is wonderful. looks like we are on the same page, fae. sometimes, you just need some umami in your life, and nikujaga is the solution. Beautifully written, so engaging. You should definitely consider a cookbook/anthropology of food book. One of my junior deerslayers is actually an anthropologist. I’m gonna be sharing this post with her. Once again, well done. it would totally be my dream to write a cookbook/anthropology of food book. the problem is getting it published. when you are a young dude with no connections or practical knowledge on how publication works, that can be a pretty tough and daunting road. still, your praise is seriously making me consider it. i’ll look into it. i’m glad you approve, anthropology is totally awesome. i was put off by the whole excavation part of it in college, but the study itself is extremely fascinating. as you can probably tell, i do a lot of reading in the field. far less dry than history, that is for sure. Good on those errant foods. If not for them, I would be writing a potato blog. in all seriousness, though, i don’t know much about irish cuisine. care to educate me on a few of your more interesting errant foods? I really liked this blog post Misha! I learned a lot not only about “errant foods” but some Japanese history I didn’t know about (that probably I might or might not have learned in my past). I agree about your comment to Conor. I only recently just started following him (via REMCooks) and oh my gosh, he’s funny! Keep up the good work Misha. I know you and I went head to head in the Diced! competition but it’s all good. You made some amazing dishes there. thanks, kathryn. i’m glad you enjoyed my post. it is my opinion that food is sometimes best consumed with a side of history. absolutely no hard feelings about diced! we both did our best, and when all ways said and done, you came out the victor. i can respect that. conor is the man. anyone who takes their meat that seriously deserves my admiration. I’m hungry for an update! I hope you’re finding time to get cooking! Hello fellow Shizuokan (Shizuokaian??)! Just ran across your site in an attempt to figure out what the flip torigara was. It’s a rainy Monday here and am going to give Sapporo Soup Curry a shot tonight. Thank you for the help. Love your recipes…they look way better than any Japanese cookbook in English I’ve borrowed from the library. Looking forward to trying some of them. Misha, hurry up with your next culinary wonder. We’re waiting. Impatiently. Did I mention the impatience? P.S hope you’re doing ok buddy. Misha…where are you? It’s been too long and I’m sure you have plenty of amazing food to share with your blogging fans. Miss your posts and hope you are doing good. i have a post in the works. my life has taken some crazy turns, so it looks like i’ll have to catch everybody up to speed. thanks for being cool and sticking with me even whilst i’ve been mia.